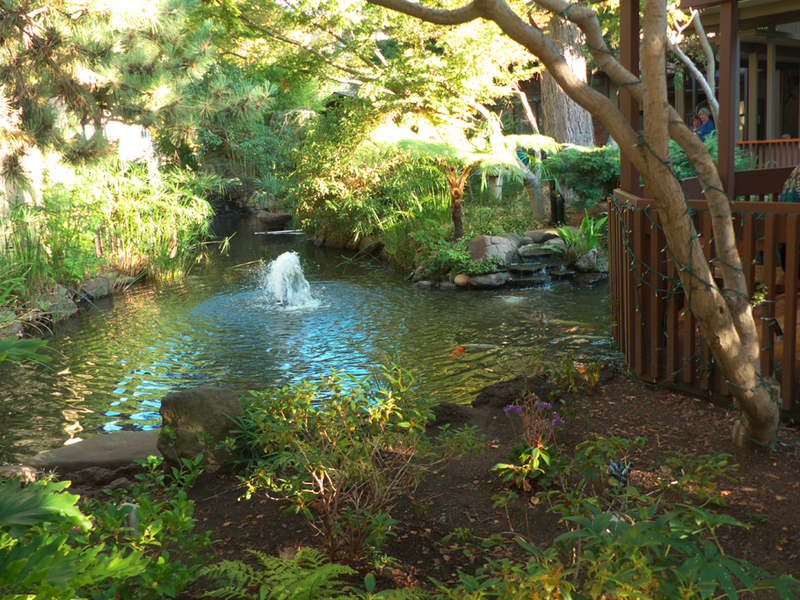 Dinah's Garden Hotel bills itself, "A lush oasis in the heart of Silicon Valley." It certainly lives up to that promise. 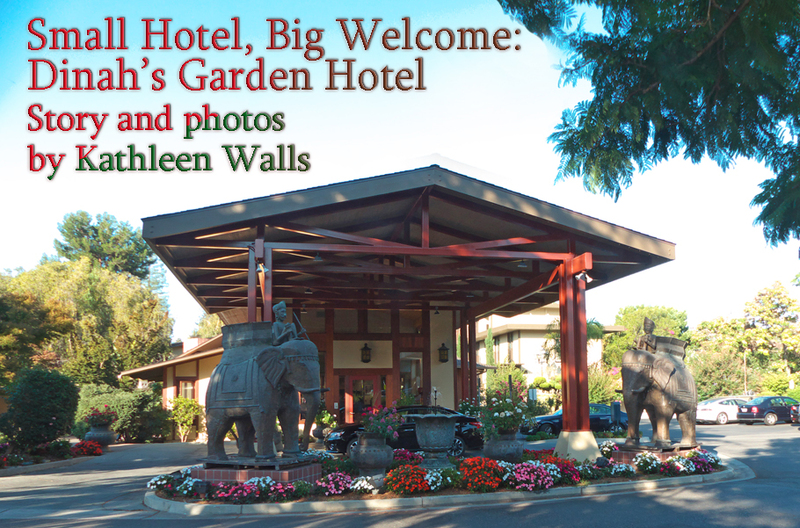 On a recent visit to Dinah's, John Hutar, the hotel's general manager, showed us around the gardenlike hotel grounds. Originally the hotel entryway location was the site of a famous eatery Dinah's Shack. Behind it there were apricot orchards. The restaurant was named for the nanny of the original restaurant owners' children. It was enormously popular so when Dinah's Garden Hotel founder, Raymond Hadley, bought the property and built the hotel, he kept the name. The natural atmosphere that was here originally still remains. As you follow the winding path thought the lush planting you arrive at a lagoon filled with gliding Koi and a happy group of ducks spanned by a Japanese-style footbridge. We fed the fish and the ducks managed to grab their share. Art mingles with nature here. A 2nd century A.D. Gandharan stone Buddha shares a place of honor with trees, shrubs, and flowers at the lagoon. None of the art here is incidental. It all has its own story. Art played a big part in the life of founder Raymond Hadley and his wife, Milla. 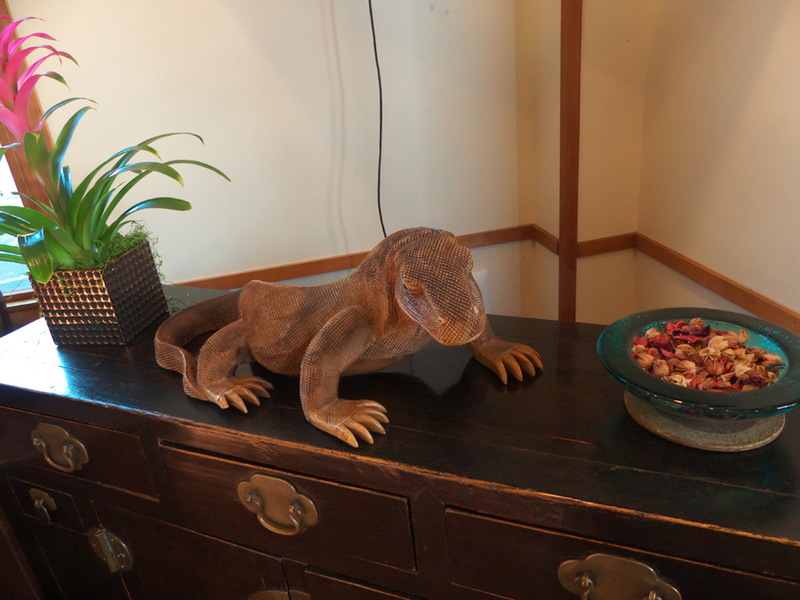 Both art and antiques were precious to them and that taste is reflected around the hotel and in the rooms. Just one of the art pieces at Dinah's Garden Hotel. Raymond loved traveling and traveled all over India, China, Africa and other parts of the world. Alfred, the director of engineering, who has been with Dinah's for 30 years, recalls that when Mr. Hanley returned from a trip, the shipping containers would arrive about 3 months later. Looking at the large elephants that grace the front entranceway, you get a feeling for how large those containers must have been. Mr. Hadley would walk around with Alfred to decide where to place each article. That kind of attention to detail is why each of the 97 rooms and 32 suites all have different art and decor. That is also a clue as to why Dinah's is successfully celebrating its fiftieth anniversary this year in May 2017. I love the era of the steam engine trains so my stay in The Railroad Baron Suite was a perfect fit. The suite was designed as a tribute to Leland Stanford, railroad magnate and founder of nearby Stanford University. 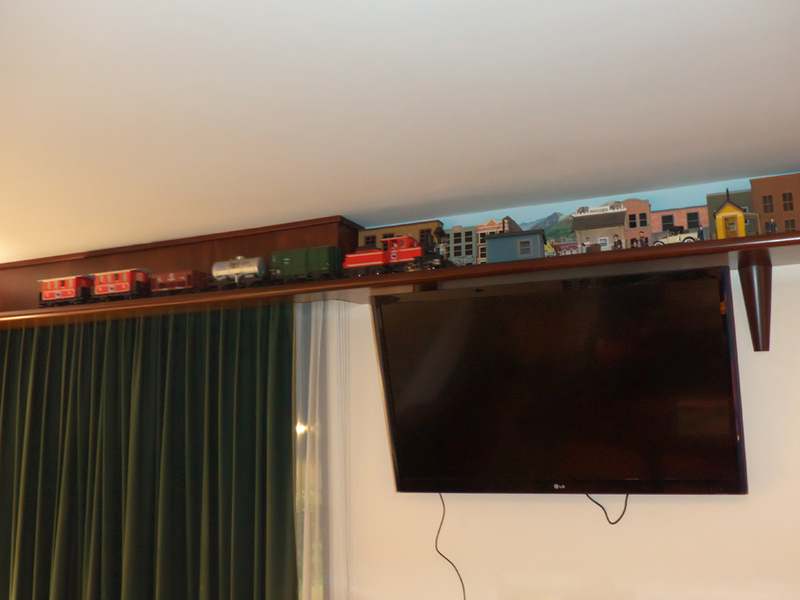 I loved playing with the realistic model electric train that ran around the perimeter of the ceiling in my room. More fun playing with my train than watching my TV. Of course, there are lots of things you need from a hotel besides playing with a train. The antique king-sized bed was super comfortable. The kitchenette was perfect and stocked with coffee and tea. There was even a fully equipped exercise room. All the usual amenities like coffee maker, cable TV, and Dinah's Garden Hotel keeps you up to date with wifi in the rooms. 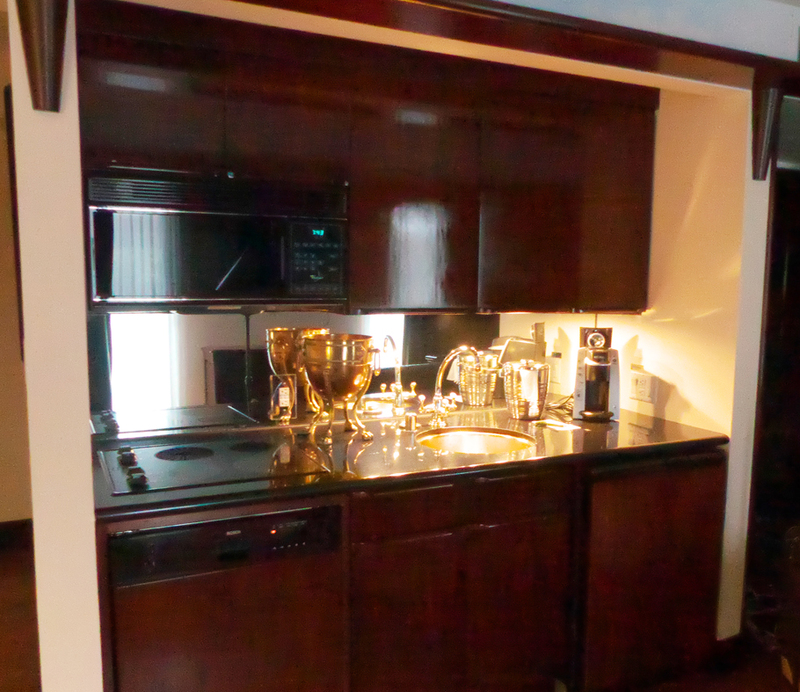 What a neat little kitchenette! There is a fitness center, business center and heated pool. There is even a car charging station for those with electric cars. This place doesn't let old fashioned hospitality prevent all modern conveniences you need to enjoy your stay. The pool is so inviting. We all need a good meal when traveling and you have to on-site choices at Dinah's, Dinah's Poolside Restaurant or THE SEA By Alexander's Steakhouse. Dinah's Poolside Restaurant is a delight almost as much for the atmosphere as the food. I loved their breakfast with fresh squeezed orange juice. There is much more about it here. 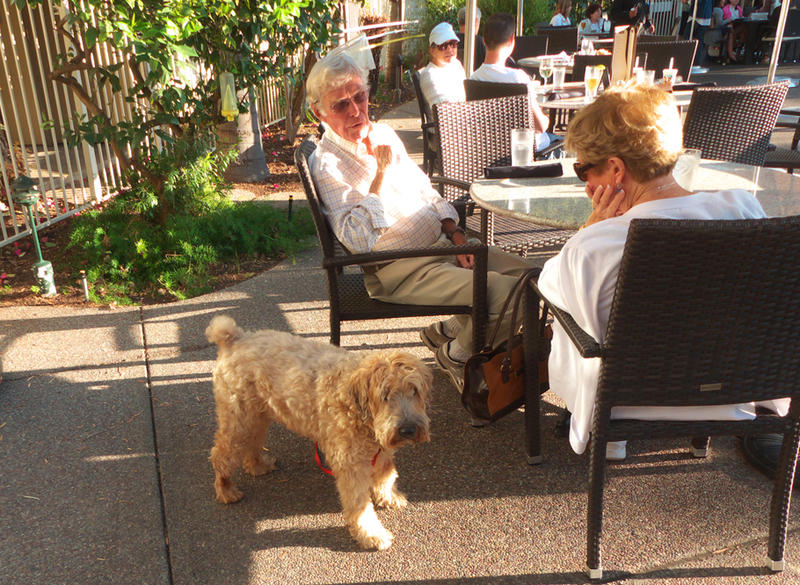 Did I mention Dinah's is pet friendly? While we didn't get to sample The Sea, its reputation is well established in Silicon Valley. It is the go-to place for scrumptious dining on the bounty of the sea. Chef Yu Min Lin is skilled at blending his Japanese influence with contemporary dishes to create a fusion delight. 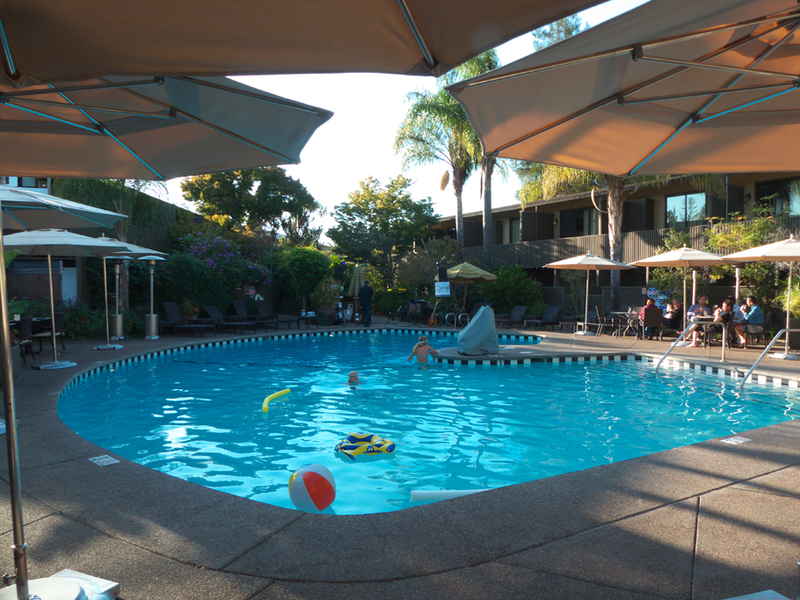 While Dinah's Garden Hotel feels like a tropical paradise, it sits in Palo Alto on El Camino Real and is only minutes away from many of the Bay Area's attractions as well as Silicon Valley and San Francisco Airport.